The best skin care routine that targets hydration and only takes 5 minutes. Taking care of our skin is a must, but it can sometimes be overwhelming. Having so many products to choose from the market and exploring which one best suits our necessities, can push us over a pile of confusion. For years I’ve been trying out multiple brands that claim to cleanse, cure acne, moisturize, and so on. Most of my trials failed and the main reason was because I wasn’t taking into consideration my skin type. 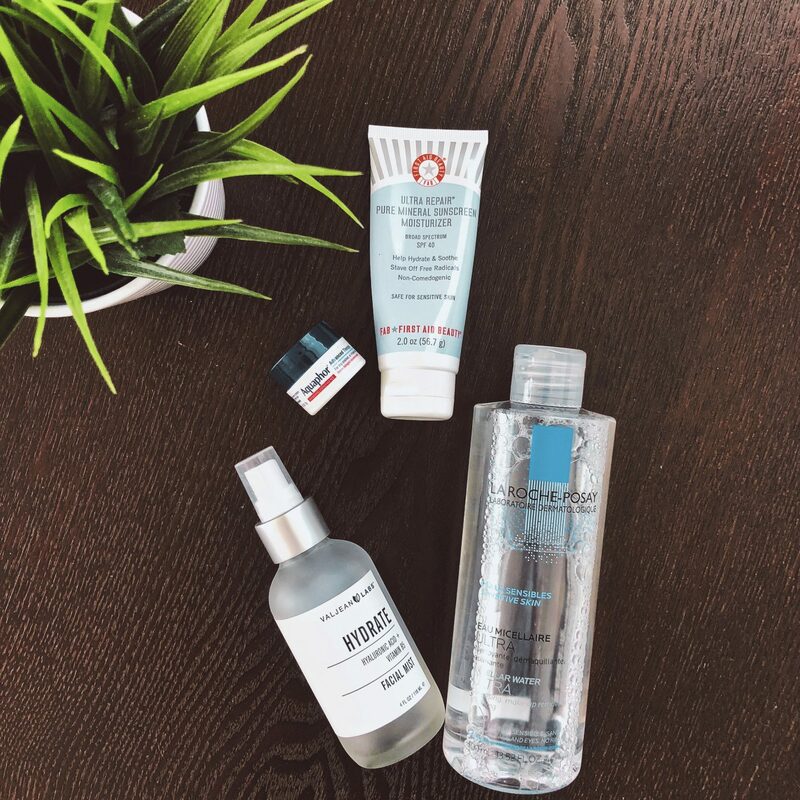 There are products for every skin, condition, and specific treatments that target those as well, even if it’s a mask to fight acne or a toner to exfoliate. The key to choosing the right products and therefore, getting better results is to identify your skin type. I you don’t feel sure enough about what you’re looking for, it’s always best to consult your dermatologist for a more accurate analysis. In my case, I have combination/sensitive skin, this means that I’m only in some areas of my face and dry in others. In general, my skin is very sensitive which means I’m very prone to any allergic reactions, especially if I use anything containing parabens and/or sulfates. Once you’ve identified your skin type, you’ll know how to treat it and take care of it by choosing products that go well with your conditions. One thing that every skin type has in common is the need for hydration. Luckily, I’ve discovered a quick and effective 5-minute skin care routine for the day time that takes care of the hydration, introducing 2 powerful ingredients: Hyaluronic Acid and Vitamin B5. This skin care is ideal for when you’re on the go in the mornings and have little or no time to even wash your face. Some of the products are very affordable, which you can find at the drugstore. You’ll feel instantly hydrated and ready for your make up. Step 1: Cleanse. | Find it here! Step 2: Face Mist (pre moisturize) | Unfortunately this product is out of stock. But you can use the serum, it’s just as good! Step 3: Wear your SPF! | Find it here. Step 4: Lip balm | Find it here!